Aliases: Draghignazzo, The Old One; "Like a Dragon," "He who Smirks"
possibly Chief Nothing Sacred, Count Zero, Erik the Red, Kid Nada, Sir Naught of Chichester, Snake Eye Malone, Tsar Zerod the Manipulative, Zero of the Ferns, "An old Friend"
Powers/Abilities: Doctor Zero possesses enhanced human strength, durability, and other physical abilities as well as the ability to manipulate electromagnetic energy. He can fly, project energy blasts, generate shields, and form a devastating "vacuum effect" that destroys most things exposed to it. He can also drain energy from living beings, weakening or even killing them, or from other sources of energy as well. By doing so, he can re-energize himself, or even amplify his powers to virtually incalculable levels. He can restructure matter, even at the microscopic level, or both living and inanimate objects. 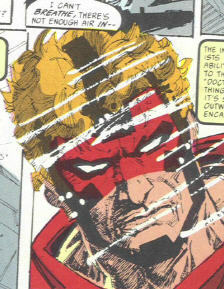 He possesses certain telepathic powers, or at least can mentally force others to obey him or tell him what he wants. He is immune to the effects of disease and aging, although he might lose this immunity if he were to take a family, like most other Shadows. Although extremely powerful, he is not a particularly talented warrior. His arrogance makes him feel as if he is invincible, and he able to be trapped or injured by less powerful beings who use better strategy. History: Dr. Zero is one of the Shadows, a race of semi-human, super-powered beings coexisting with humanity. Throughout the majority of his existence he has used his power to manipulate events and people to guide the course of humanity in the direction he sees as appropriate. (Dr. Zero#7 (fb)) - Dr. Zero claimed to have originated back in the Earth's primordial soup from which the first living beings originated, billions of years ago. (Dr. Zero#8 (fb)) - Over 1000 years ago, Dr. Zero attacked and defeated the Shadow Bryn Hengist. Zero anticipated that's Hengist's protection and alliance with the Saxons would shift the balance of power away from where he wanted it to go, and so he broke that alliance, erased Hengist's memories (and knowledge of his powers), and destroyed the village in which he lived. BTS - Zero becomes known as the Draghignazzo, or the Dragon, which inspires Georgia of Cappadonia, who in turn inspired the Order of St. George. (Critical Mass#5/2 (fb)) - In the Dark Ages, Zero is gravely wounded by George of Cappadonia. Zero has his squire, the then mostly human Shreck, bury him, to complete the illusion of his death, and to allow him to recover his strength in solitude. (Critical Mass#5/2 (fb)) - Centuries later, at the same time that the Order of St. George had unleashed the black plague on humanity, Zero revived, completely recovered from his near death. (Critical Mass#2/2 (fb)) <1908> - Near the Tunguska River, Zero battled a Knight of the Order of St. George. Zero was sorely pressed in the attack, and was forced to unleash his "vacuum effect" to destroy his foe. However, the Knight's armor had a failsafe device in preparation for the effect, which turned its energies back on Zero, nearly killing him. He was buried under some rubble and might have actually died, but he was saved by a young Vlad Gerasimov, who nursed him back to health. Vlad, and later his son, Gregor, earned Zero's undying gratitude and friendship. BTS - In the modern era, Dr. Zero fell in love with a human woman, Sheila Willis. (Powerline#3 (fb)) - In the Black Forest of Germany, Dr. Zero encountered Lenore Castle, a young Shadow who would later become part of the Powerline. He may have tried to seduce her, but this was seen only as a dream sequence while Lenore was in a state of delirium. However, they both recall meeting each before at a later date. (St. George#8 (fb)) <2/20/1983> - Dr. Zero defeated Jeong Lee, the Knight of the Order of St. George, causing him to question his faith, and to retire from the position. (Dr. Zero#1) - <April, 1986> - The Old One took the name and costume of Dr. Zero and made his public appearance, posing as a superhero, while continuing to manipulate events as he saw fit. He stopped a sect of Libyan terrorists and saved President Ronald Reagan and his advisors from a missile attack. He then headed to intervene in the revolution in Gunyana, but he was discovered and attacked by Kara Janisery, the current Knight of the Order of St. George. Dr. Zero had discovered the newly formed Powerline and hoped to learn more of them, but he lost track of them due to Janisery's attacks. Dr. Zero then slew Janisery. (Dr.Zero#2) - Forcing information from Michael Crimpton of the CIA, Dr. Zero learned of the activities of Professor Henry Clerk, who wished to set of a nuclear chain reaction that would ignite the atmosphere and destroy all life on Earth. He confronted Clerk at his arctic research station, the Toy Factory, but Clerk had learned of his intentions and prepared for him. Using a combination of a precisely designed chemical fire and an electrical weapon, Clerk shorted out Zero's powers and believed him to be dead. Clerk buried his body in the arctic wasteland. (Dr.Zero#3) - Still alive, but extremely weakened, Zero dug his way out of his grave and had his dolphin friends carry him to the distant ship of his lover, Sheila, where he recovered. Recharged, he again confronted Clerk, neutralized the missiles he had already launched and destroyed Clerk's mind, leaving him a nearly mindless wreck. (Dr.Zero#4) - Zero discovered the plot of Anubis to unleash a virulent strain of Cryptosporidium on the Earth. Zero cured and then slew Anubis and cured some of his victims. He was forced to kill Mikhail, the father of a Russian family, in order to completely eradicate the organism. (Dr.Zero#5) - Zero saved two men form a booster launching accident, but then directed another man to crash his truck into another rocket base, to slow the development of this technology. He met with Shreck, who informed him of the existence of Michael Devlin, the newest Knight of the Order of St. George. He agreed to allow Shreck to oppose Devlin, but forbid him from killing Devlin. Another Shadow, Marid, sought to launch a series of missiles which might initiate World War III, but Zero managed to destroy him--though only with the aid of Shreck. 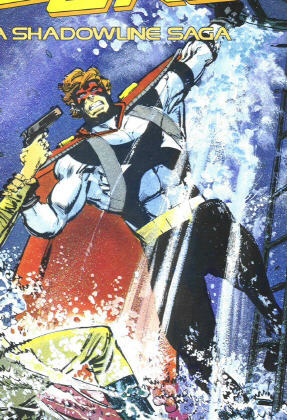 (Dr.Zero#6) - Zero walked into a MERCHANT trap aboard a submarine. He ended up killing almost everyone aboard, but was wounded and trapped in the submarine as it sunk rapidly. His powers drained nearly to their limit, he was forced to wrap himself in steel and enter an inert state. It was in that state the other MERCHANT agents located and captured him. (Dr.Zero#7) - The Merchants continued their study of the seemingly inert Dr. Zero, who was in actuality now aware, and was recovering and fully recharging himself. Upon fully recovering, he slaughtered all involved and destroyed their base, leaving only the otherwise innocent neophyte agent Donald Gaffney alive. (Dr.Zero#8) - Zero was observed by Brian, the dim owner of a newsstand. Seeing Zero began to restore Brian's memories, and he eventually recalled his life as Bryn Hengist and sought vengeance on Zero. Hengist nearly defeated Zero, but Zero managed to turn the tide and drain the life from Hengist. (Critical Mass#1 <Dr. Zero#9>) - Learning that Henry Clerk had managed to defeat Dr. 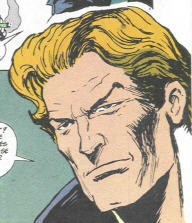 Zero, Dirk Ravenscore sought him out as an enforcer for his organization. Ravenscore healed Clerk's mind, restoring his genius, although leaving him none the saner. Clerk began to develop his plan to flood the planet with radiation, thus leaving many survivors, with diseases and mutations of interest to him. Dr. Zero performed several acts to maintain his Good Samaritan image, and renewed his love affair with Sheila Willis. (Critical Mass#2/2 <Dr.Zero#10>) - As part of his nuclear plot, Clerk sent his agent, the Grey Man, to murder a number of nuclear physicists across the planet, who might be able to uncover what he was doing before it was too late. Zero, along with his ally Gregor Gerasimov, investigated these attacks. Zero might have captured the Grey Man, but was forced to devote all of his energies into saving Gregor, who had been mortally wounded by the Grey Man. (Critical Mass#3/2 <St.George#10>-BTS) - Clerk's agent, the Grey Man, discovered that it was Sheila Willis who had helped save Zero before. He decided that she was his weak point, and planned to use her to stop Zero from interfering with his plans this time. (Critical Mass#4 <Dr.Zero#11>) - Zero freed Gregor and prevented a military debriefing. He was later attacked by Abbot, the head of the Order of St. George, wearing the first armor he had ever built. Zero attempted to stop the conflict, but Abbot continued to attack him relentlessly so that he was forced to unleash his full power on Abbot, nearly killing him. (Critical Mass#5/2 <Dr.Zero#12>) - Zero shared a romantic interlude with Sheila Willis. He was not gone long when Clerk and the Grey Man ambushed her, intending to kidnap her. She fought back, striking Clerk across the face with an oxygen tank. Furious, Clerk attacked her savagely, beating her to death. Zero found her body, too late to save her. He found a button that had belonged to Clerk, and realized that he had allowed this to happen by not killing Clerk before. (Critical Mass#6 <Powerline#12>, CM#6/2 <St.George#12>) - Furious and seeking an outlet for his rage, Zero traveled to Greece, where he assaulted the stronghold of the Order of St. George, who had plagued him over the centuries. Ultimately, the current Knight, Michael Devlin, wearing freshly forged armor (which Abbot expended his life in making), succeeded in stopping Zero long enough to force him to listen to them. Devlin told him of Clerk's plans, and convinced him to join forces with he, his new allies the Powerline, and other associates. (Critical Mass#7 <Dr.Zero#13>//CM#7/2 <Powerline#13>//CM#7/3 <St.George#13) - Zero worked together with Powerline, Michael Devlin, and Gordon Castle, and the forced aid of Dirk Ravenscore. Zero located Donald Gaffney and convinced him to give him Clerk's location, and the specifics of his plan. Zero assaulted Clerk at the Ft. Vrean reactor, where he had already begun his plans to initiate the worldwide meltdown chain reaction. Zero foolishly squandered his energy stores, blasting apart the facility as he searched for Clerk. Upon being discovered, Clerk pretended to poison himself with cyanide to rob Zero of his vengeance. Zero was unprepared when Clerk suddenly leapt up and emptied a machine gun into his chest and abdomen. However, Zero's dense body structure and his energy stores kept him alive, although down to the power level of a normal man. Nonetheless, he attacked Clerk, intending to beat him to death, regardless of the imminent meltdown. Devlin interrupted, knocking them both out with his staff and flew them out of the facility to the escape helicopter. As Zero revived, his rage was undiminished, and he hurled Clerk out of the helicopter and back into the reactor, just as Gordon Castle (his powers amplified by both Ravenscore and the Powerline kids) teleported the reactor and the ground underneath it out into space. Zero buried Sheila's body at sea: his dolphin friends carried it out, far from the coast. Uncertain of his path, he stayed in the solitude of his boat. Comments: Created by Archie Goodwin, written and illustrated by D.G. Chichester, Margaret Clark, and Denys Cowan. Dr. 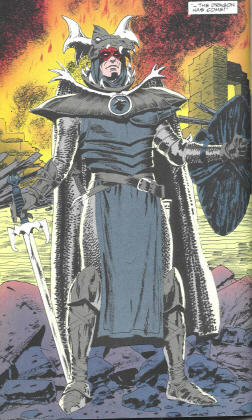 Zero is the name that the "Old One" took in the modern era when he made his public appearance as an apparent superhero. For the purpose of this profile, he is referred to as Dr. Zero throughout his history. Chief Nothing Sacred (1870), Kid Nada (1875), Snake Eye Malone (1925), Count Zero (1936), and "an old Friend." Dr. Zero#9-13 were supposed to be part of the Shadowline crossover Critical Mass. 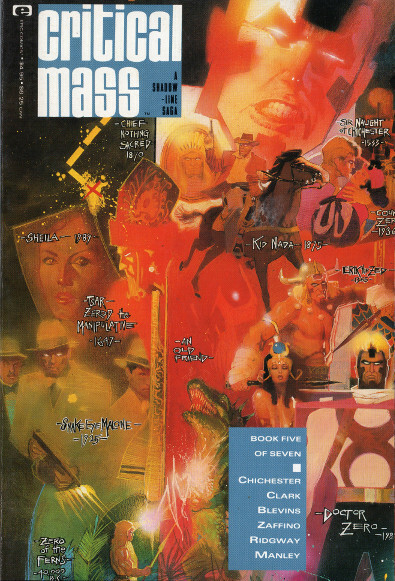 Instead, due to poor sales, Epic cancelled the three Shadowline series and instead published the story as the double-sized, seven issue limited series Critical Mass. As per usual in comics, movies, etc., the nomenclature of microorganisms was incorrect in Dr. Zero#4. Cryptosporidium is not a virus (although it is virulent, meaning contagious or powerful, depending on the connotation)--it is a protozoan.